This sword ornament (abosodeẹ) was cast in gold via the lost-wax technique, but further decorated by repoussé work, including tassels and swags that "fall" upside-down. Its form mimics European metal vessels of the late 18th and 19th century, the type of status gift Europeans often presented to coastal rulers or possibly to the Asantehene himself. Ceremonial state swords, publicly displayed at festivals, frequently had their own jewelry. First recorded in the 17th century, these ornaments became increasingly popular in the 18th and 19th century; many casters produced them in the early 20th century as replacements for earlier looted gold. Many ornaments have proverbial associations, while others represent defeated enemies' heads. Although this piece is associated with the reign of Asantehene Prempeh I, the piece only left Asante hands during his reign; it appears to have been made decades before. Rev. Freeman mentioned that he saw it in 1839, when Asantehene Kwaku Dua I sent him a message; one of the high-ranking officials who delivered it bore "an immense gold sword, to which was fastened a golden decanter." As Ross notes, its loss resulted in a 20th-century replacement for the Asantehene. 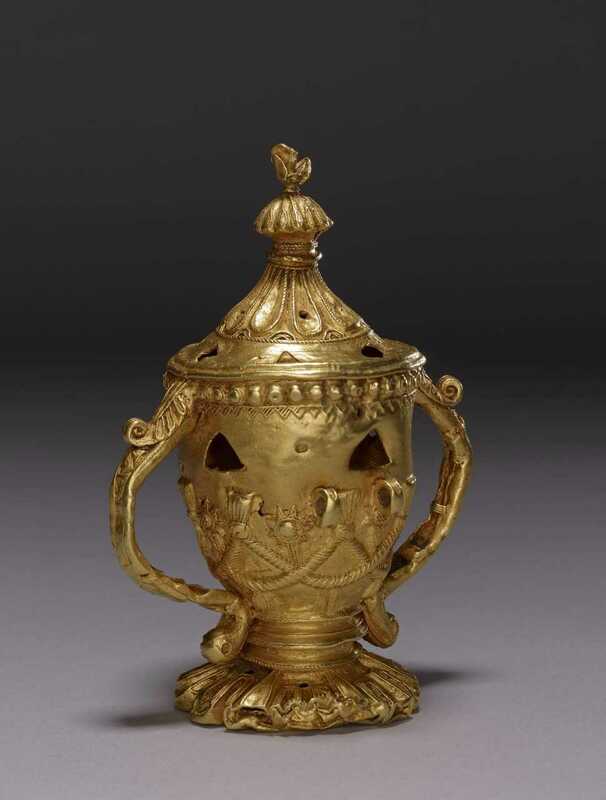 This version is called kuduo (the container used for gold dust and other valuables), and refers to the Asantehene as the provider for his subjects. Similar European-style double-handled vessels, as well as teapots. adorn chiefs' and provincial rulers' state swords, but their association is with family unity, as Ross observes.